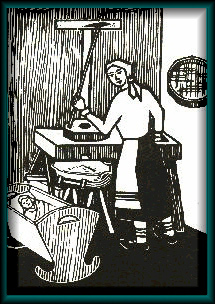 In just about every Lemko house, a very honorable place was reserved for the hand mill (a millstone), which was used for grinding grain into flour for bread and other goods. Not every stone would produce good millstones, - in Lemkivshchyna the good material was only available from the village Bortne. The type of rock in question was brown in color, of granite origin, and very hard. The craftsmen from Bortne also made tombstones from it, but mostly hand mills, which they sold locally, or at markets in nearby towns. If properly cared for and sharpened by the experts, a good round stone (two are needed for a set) from Bortne would sometimes serve a family for up to 100 years. For proper maintenance, from time to time the shallow but wide groves were sharpened closer to each other, starting in the middle, and running towards the outer edge. The main body of the mill, so called "kolodka" was made of pine wood or of spruce, about three feet in length. The stones were mounted on one end of the "kolodka", while the protruding end contained a "yamka", or a recess, (for the grain which was to be ground. Right across from the stone, in the "kolodka", a pit was carved out, so called "loshok", through which the ground mixture poured into a wooden utensil named "vahan". The top stone had a hole in the middle of it, into which grain was added by hand, while the other hand uninterruptedly continued to turn it by holding on to "zhornivka" *. The lower end of "zhornivka" rested against a hole on the edge of the stone, while the opposite end passed through the yoke, so called "nashcheka", which was attached to the wall. The top stone, at the bottom of the center hole, had imbedded perpendicularly to it, so called "porplitsia", which was made of hard wood, and it in turn had a metallic "nest" carved out within it. A metallic "cheep" joined the main body ("kolodka") through the bottom stone, which rested on a wedge, so called "klyn", under the lock. The texture of the ground mixture was regulated by the wedge and the "cheep", which was used to lower or to raise the upper stone. The entire contraption stood on four feet, held together with appropriate planks of wood. Running such a hand operated flour mill, one person working continuously for two hours, was able to produce enough cracked grain to make from four to five two kilogram loaves of bread. This coarse mixture was then sifted, in order to separate the bran, by utilizing a fine mesh sieve. A considerable amount of bran found its way into the bread anyway and even though the bread was black, it was very delicious and healthy. During the latest period of time, one might have caught sight in certain Lemko houses of a so called "solotruka", a small piece of stone slab, with a recess within it, and a second very round stone, which was used to crumble rock salt by hand. Some families used it even for sugar, which was bought in ingots, so called "stopky".